Dr. David Green, Director, NC State Seafood Laboratory. The Seafood Laboratory in the Department of Food, Bioprocessing and Nutrition Sciences, College of Agriculture and Life Sciences represents NC State’s long-standing commitment to the North Carolina seafood industry. 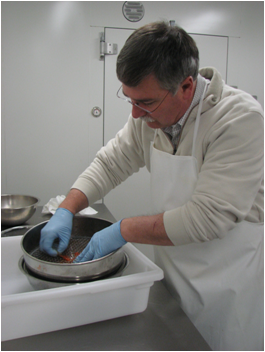 Laboratory staff provide solutions for industry in product safety, processing technology and value-added products utilizing fresh- or salt-water fish and shellfish. Extension education and training programs are offered in basic Hazard Analysis Critical Control Points (HACCP), Good Manufacturing Practices (GMP) and Sanitation Standard Operating Procedures (SSOP). Technical services are available for process validations, equipment verifications and product shelf-life determinations. Research is focused on development of rapid analytical methods for use in monitoring the quality and safety of aquatic food products. Current interests are in post-harvest treatment to reduce pathogenic Vibrio bacteria in shell oysters and use of ozonated micro-bubbles to reduce off-flavors and spoilage bacteria in aquaculture fish and value-added products. For more information, visit the NC State University Seafood Laboratory website.